Positron emission tomography (PET) and computerized tomography (CT) are both state-of-the-art imaging tools that allow physicians to pinpoint the location of cancer within the body before making treatment recommendations. The highly sensitive PET scan images the biology of disorders at the molecular level, while the CT scan provides a detailed picture of the body’s internal anatomy. The PET/CT scan combines the strengths of these two well-established imaging modalities into a single scan. A CT scan is able to detect and localize changes in the body structure or anatomy, such as the size, shape and exact location of an abnormal growth, a sizeable tumor or a musculoskeletal injury. A PET scan is very different from an ultrasound, X-ray, MRI, or CT scan. A PET scan allows the physician to distinguish between living and dead tissue or between benign and malignant disorders. Since a PET scan images the biology of disorders at the molecular level, it can help the physician detect abnormalities in cellular activity at a very early stage, generally before anatomic changes are visible. Alone, each imaging test has particular benefits and limitations but by combining these two state-of the-art technologies, physicians can more accurately diagnose, localize and monitor cancer, as well as heart disease and certain brain disorders. The majority of PET/CT scans are performed for oncologic applications. Physicians utilize PET/CT scans for diagnosing, staging and evaluating treatments for their cancer patients. A PET scan helps the physician distinguish between living and dead tissue or between benign and malignant disorders. PET imaging provides the physician with additional information about cellular activity which guides the characterization of a questionable abnormality as malignant or benign. A PET/CT scan can show the extent of disease. For patients whose cancer is newly diagnosed, it is important to determine if the cancer has spread to other parts of the body so that appropriate treatment can be started. A PET scan images the entire body in a single examination, and aids the physician in detecting the primary site(s) as well as any metastases. Painful, costly and invasive surgery, such as thoracotomy, may no longer be necessary for diagnosis. 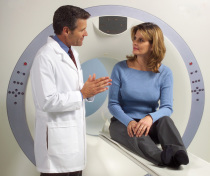 A PET/CT scan can also help physicians monitor the treatment of disease. For example, chemotherapy leads to changes in cellular activity that is observable by PET/CT long before structural changes can be measured. This gives physicians an alternative technique to evaluate treatments earlier, perhaps even leading to modifications in treatment, before an evaluation would normally be made using other imaging technologies. After treatment is complete, a PET/CT scan allows the physician to investigate suspected recurrence of cancer, revealing tumors that might otherwise be obscured by scar tissue resulting from surgery and radiation therapy. 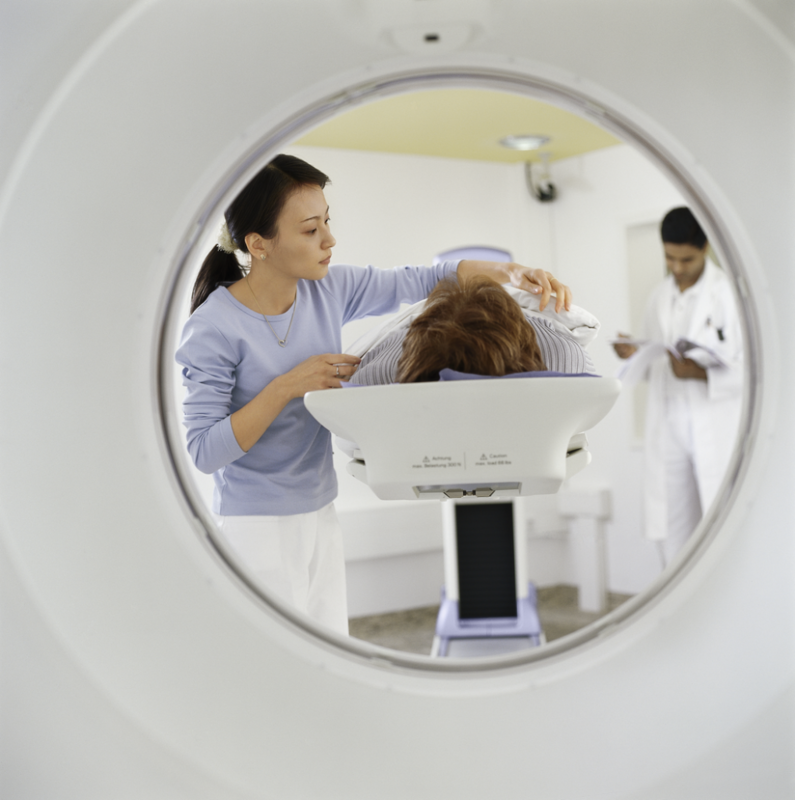 A PET/CT scan puts time on your side. The earlier the diagnosis and the more accurate the assessment of the extent of disease, the better the chance for successful treatment. When disease strikes, the biochemistry of cells and tissue changes. In cancer, for example, cells begin to grow at a much faster rate. In one continuous whole-body scan, PET/CT captures images of changes in the body’s metabolism caused by actively growing cancer cells and provides a detailed picture of the body’s internal anatomy that reveals the size, shape and exact location of the abnormal cancerous growths. The PET/CT scan begins with injection of a glucose-based radiopharmaceutical which travels through the body, eventually collecting in the organs and tissues targeted for examination. The patient lies flat on a table that moves incrementally through the PET/CT scanner. The CT portion of the exam sends X-rays through the body which are then measured by detectors in the CT scanner. A computer algorithm then processes those measurements to produce images of the body’s internal structures. The PET scanner has cameras that detect the gamma rays emitted from the patient, and turns those into electrical signals. These are processed by a computer to generate the images. The table moves slowly through the scanner and many sets of PET and CT images are produced. The CT and PET images are assembled by the computer into a 3-D image of the patient’s body. If an area is cancerous, the signals will be stronger there than in surrounding tissue, since more of the radiopharmaceutical will be absorbed in those areas. Each imaging modality can be viewed independently of the other without compromise, or used in concert for complementary functional and anatomic diagnosis. PET/CT is a highly sensitive procedure that aids in the detection of small cancerous tumors and subtle changes in the brain and heart. This enables physicians to identify and treat these diseases earlier and more accurately. Copyright © 2019 Pullman Regional Hospital. All rights reserved.